Solar installer and financier SolarCity (s SCTY) is getting into the solar manufacturing market for the first time with the announcement that it plans to acquire a solar cell maker startup called Silevo. According to a filing SolarCity will pay $200 million worth of SolarCity common stock at the close of the transaction, and an option for another $150 million in shares upon achievement of certain milestones. Founded in 2007 and based in Fremont, California, Silevo developed a new type of solar cell design using silicon (the main material in traditional solar panels) but also combining different materials for other cell components to squeeze more energy out of the system and to improve the cell’s efficiency. The company uses more efficient single-crystal silicon as the base layer, and then it adds on a “tunneling oxide layer” and a layer of amorphous silicon to alter the voltage and current of the cells. In a blog post, SolarCity CEO Lyndon Rive called Silevo’s tech “what we believe is fundamentally the best photovoltaic technology,” and said SolarCity plans to scale up their solar manufacturing to 1 GW within two years and larger in subsequent years. At 1 GW, the factory would be one of largest in the world. SolarCity said it is looking at New York for the first factory. Silevo had raised at least $55 million from three China-based investors: DT Capital (affiliated with Madrone Capital), NewMargin Ventures, and GSR Ventures (connected to Mayfield Fund). GSR Venture’s Richard Lim is the securityholder representative on the acquisition filing. 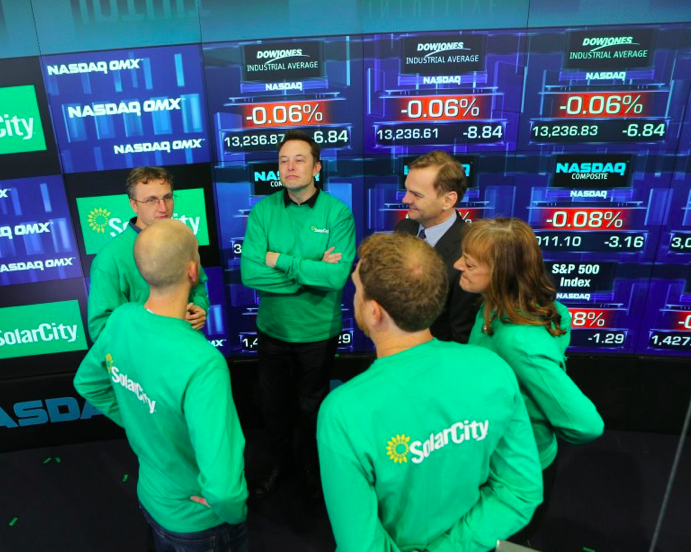 SolarCity at the NASDAQ, image courtesy of NASDAQ. The news is surprising because it means SolarCity has jumped squarely into the solar manufacturing market. Previously the company has focused on financing, installing and marketing solar panels. But now the firm could also be making its own, meaning its becoming a much more vertically-integrated company. 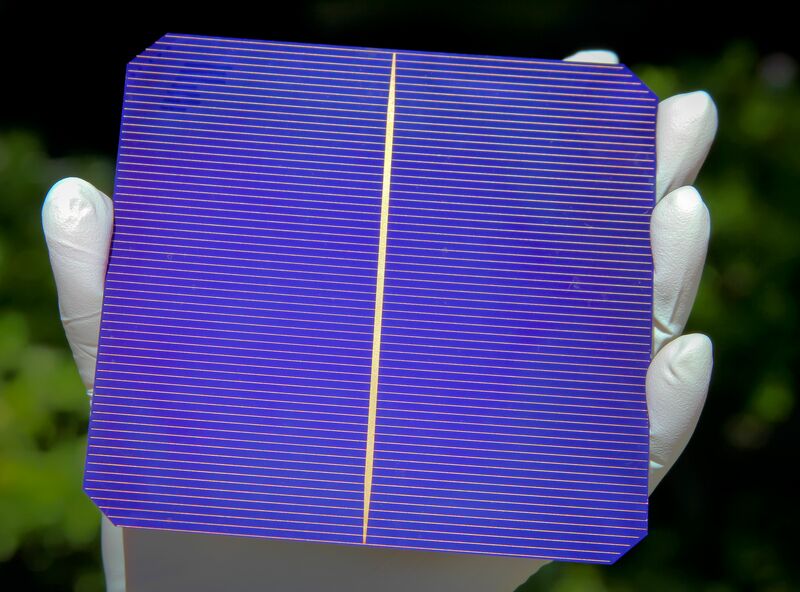 The Silevo solar cell can deliver 24 percent efficiency when it’s been scaled up in production, for the same cost of making a standard cell, said SolarCity CTO Peter Rive on a conference call later in the morning discussing the deal. The cell can be made from standard off-the-shelf manufacturing tools from the semiconductor industry. “We’ll be the most vertically integrated company in the world,” when this is built out, said Rive. Note that Tesla recently announced that it will make all its patentable technology open source, essentially giving it away. THIS will be the next breakthrough in practical solar energy, development of a reliable, long-lived, (relatively) inexpensive storage. Silicon-based solar cell efficiency, practically speaking, will peak at about 25 percent, that is simple physics. As ILIAD for French Telecommunication, SpaceX is completely redefining the market of space rocket launch. He obliges restructuring Safran (Ariane) into Airbus group in June 2014. Elon Musk is also the CEO of Telsa, a company selling only electric cars in USA! Elon Musk is a serial creator, as he was the creator of Paypal sold to Ebay in the 2000â€²s years. I’m not expert on energy, but as I recall combustion engines generate ONLY 25 % efficiency. So what are we complaining about when it comes to alternative energy producing the same amount of energy with no pollution. Elon, using the existing batteries produced by Panasonic, tweaked how it is bundled to increase power and charged time for car batteries and we got a Tesla car that can run longer than 200 miles on a single charge. I like his mind to go worked also on solar panels that can produced more electricity efficiently and cheaply to compete with fossil fuesl. Make the giga factory for car batteries work too on solar panels and open up more job opportunities. Elon, bring back the labor from abroad to the US and truly make this a new economic revolution for America. Give back the opportunities to our new emerging generation to get them to manufacturing and producing. America is not just consumers, we are also “quality” producers. Thanks Elon and Lyndon Rive. Katie, any idea if Silevo under SolarCity would be susceptible to the discussed importation tariffs that were being considered for solar panels just a few weeks ago? If not, that would be a huge financial coup for SolarCity. @Dave, I’m not sure, but I would think if Silevo is manufacturing in the U.S. in New York they wouldn’t be susceptible to them. You’re talking about Chinese solar panels right? As this NYT article says, that was a big win for US solar companies: http://www.nytimes.com/2014/06/04/business/energy-environment/us-imposing-duties-on-some-chinese-solar-panels.html. You can’t rely on subsidies forever! Technology wins are needed for renewables and if they can scale at 24% efficiency, that’s great news for the industry. @claybabe007. Agreed. Silevo is currently doing 21% in production, 23% in the lab, and 24 is the expectation for the scaled up production from the factory in NY. They say also that 26.5% is possible ground-mounted with trackers. On the flip side, if Americans have any horse sense, we will get a just penalty on pollution (and reduce the penalty on work and income instead). We can’t go on without a carbon price forever. It’s inevitable, and when it comes it will be substantial.